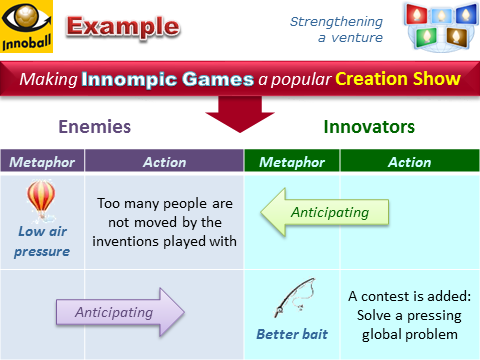 Similar to other our breakthrough innovations (logos), Innompic Games is a solution to several global problems. Intellectual teamwork is too chaotic. It's often dominated by a single person, while other contribute too little. >> "Garden" and Kitchen"
Team leaders have too little time for evaluation of all the ideas submitted by the team members. >> Teams will assign a weight to each guiding principle to enable quick ‒ within a matter of seconds ‒ evaluation of an idea. Judges have no criteria for evaluation of anticipation skills >> The teams will be asked to provide a structured description of their move ‒ (1) Kore 10 Tool used (2) Symbolic action (3) Precise action ‒ to make evaluation easier and better. ... >> ... >> Evaluation of ideas by Judges / Volunteers / Internet spectators may be influenced by personality of players and nationality of a team >> Flash Light >> Turned Off >> Players and teams will be hidden behind symbolic names (Team A, Player A1, Player A2, etc.). Real names will be revealed after all the evaluations have been completed. Good spectators' ideas won't reach the judges if valuenteers who pre-assess spectators' ideas are not competent enough. >> A sample Innoball game will be played in advance to both teach the judges and the valuenteers to assess ideas and evaluate their idea evaluation skills. In addition, during the Innompic Torch Relay, Judges and Valuenteers assess each message to the World simultaneously. The author of the best message is rewarded. Assessment skills of each valuenteer are pre-evaluated and weighted before the Games begin. End-user opinion is not counted in evaluation of contestants' ideas >> Internet-spectators will be provided with an opportunity to give marks to contestants' ideas. For an average spectators' mark to be counted, at least 1,000 spectators should evaluate an idea. In case the spectators' and the judges' mark of an idea differ too sharply, a third-party evaluation will be made that will have an impact on evaluation of both the idea and the judges. Special prizes will be given to the public-opinion winners.